I know, some people would rather not spend the time picking over a discount store’s merchandise where they only have a few of each item, however, I highly encourage it. You can find great items that would otherwise be sold at some of the top department and specialty stores, but at a much lower price. 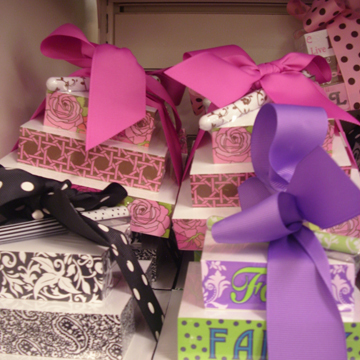 My husband and I recently took a trip to T.J. Maxx to look for desk organizers and decor for my daughter’s birthday present. We snapped some photos of some of the lovely items they had that I though you might enjoy for your boudoir, office, dining room, patio, etc. 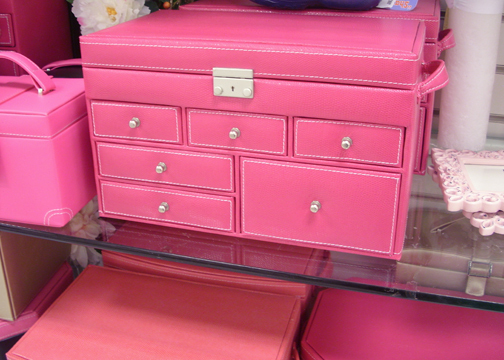 As I headed for the aisle with office decor, these leather jewelry boxes were screaming at me on the end cap. Aren’t the beautiful? They had them in shades of pink, pink/black, beige and turquoise/brown. These notepads are so darling and would look so nice in a boudoir for writing a quick reminder note. I particularly love the cane lattice print. 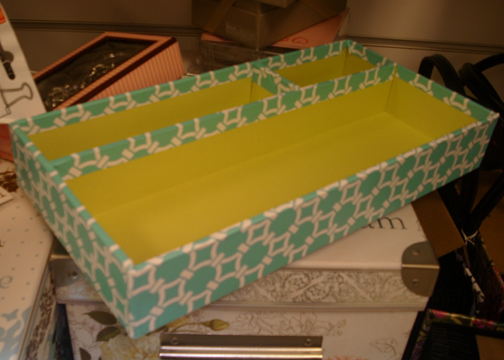 This little desk (or vanity) organizer caught my eye because of the color and pattern combination. 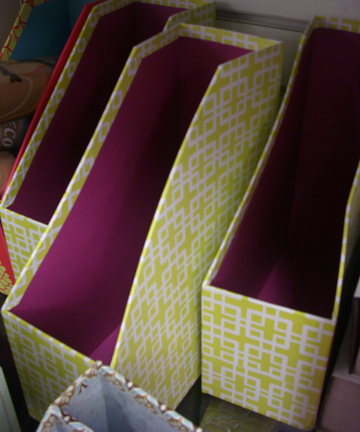 And the same with these magazine organizers. How about organizing Elle and Vogue in month/year order? Nice! 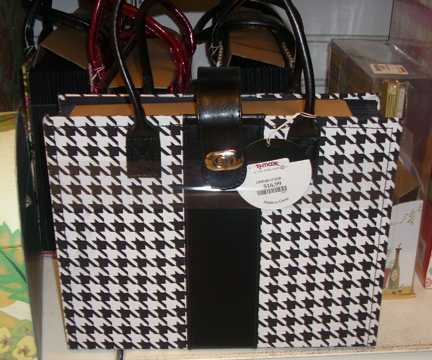 houndstooth handbag-esque file bag is perfect for a fashionable gal. 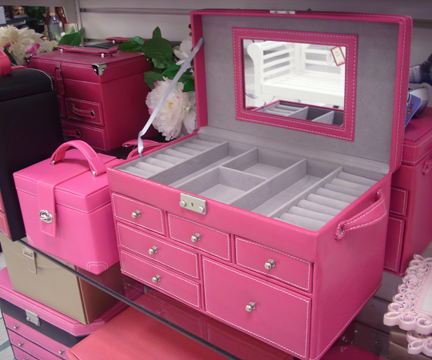 You know you couldn’t live without this somewhere in the home. I wasn’t going to place this picture, because my husband insisted on using the flash (which took out her face), but I knew you boudoir beauties would appreciate it anyway. 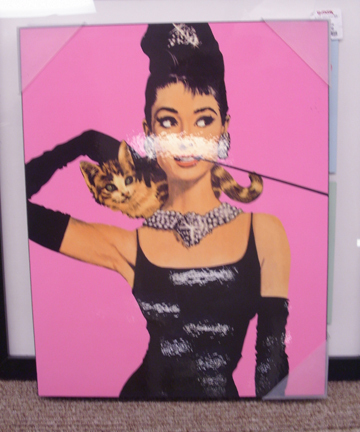 Who doesn’t love Audrey and Tiffany & Co.? 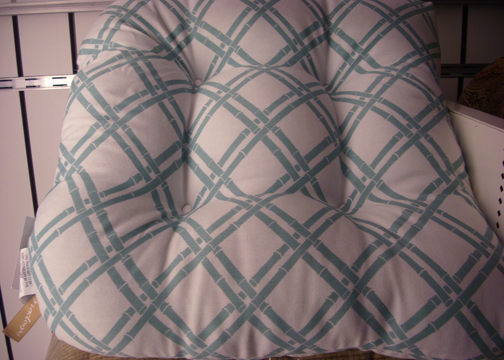 And lastly, a turquoise bamboo printed seat cushion. Perfect for any chair, whether it’s in your boudoir, dining room or out on the patio.